(Nanowerk News) Scientists at the University of Kentucky, led by nano-biotechnologist Peixuan Guo, have made some critical discoveries over the past year into the operation of biomotors, the molecular machines used by viruses and bacteria in the packaging of DNA. Biomotors function similarly to mechanical motors but on a nano-scale. Last year, Guo's team reported the discovery of a new, third class of biomotor, unique in that it uses a "revolution without rotation" mechanism. Rotation is the turning of an object around its own axle, as the Earth does every 24 hours. Revolution is the turning of an object around a second object, as the Earth does around the sun. Recently, Guo's team reported that these revolution biomotors are widespread among many bacteria and viruses. Guo, director of the Nanobiotechnology Center and the William Farish Endowed Chair of Nanobiotechnology at the Markey Cancer Center and UK College of Pharmacy said these biomotors are of great interest to medical researchers. "DNA-packaging technology has tremendous potential applications in the diagnosis and treatment of viral diseases and cancers, as well as in personalized medicine and high-throughput human genome sequencing," he said. "The DNA packaging motor itself can serve as a high efficient drug target for the development of anti-viral and anti-bacterial therapy." Guo hopes the current findings will generate new momentum in the viral-assembly field among young scientists. In his early career, as a graduate student in Dwight Aderson's lab, Guo constructed the first viral motor outside the cell, the DNA-packaging motor of bacteria virus phi29. He also discovered one of the vital components of the motor, the six-membered RNA ring that gears the phi29 DNA-packaging motor. His postdotoral experience at NIH with Bernard Moss, a renowned scientist in vaccinia virus studies and a member of the National Academy of Sciences, expanded his vision on the DNA packaging of animal and human viruses. Research on this motor led to dozens of papers published and debated in many prominent journals such as Nature, Science, Cell, PNAS, Molecular Cell, PLOS Biology, EMBO J, Virology, ACS Nano, RNA, Nature Nanotechnology, Nature Protocol, Cell and Bioscience, Biotechnology Advances, Current Opinion of Biotechnology, Advanced Virus Research, Biophysical Journal and the Journal of Virology. However, the main mechanism of motor action over many years of studies has not been elucidated until recently, Guo says. In 1998, Guo and his lab began to test a new hypothesis. Guo's research has persisted, and it continues to strongly support the ATPase hexameric model in viral DNA packaging. 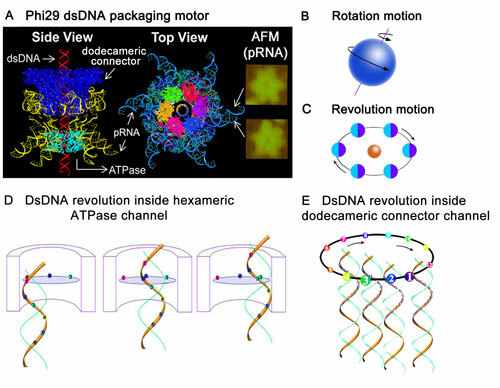 Now, discovery of the revolution motor has solved many puzzles that have eluded researchers throughout the 35 years of investigations of the mechanism of dsDNA translocation motors. Guo P. Biophysical Studies Reveal New Evidence for One-Way Revolution Mechanism of Bacteriophage phi29 DNA Packaging Motor. Biophysical Journal 2014, May,106:1. De-Donatis GM et al., and Guo P. Finding of widespread viral and bacterial revolution dsDNA translocation motors distinct from rotation motors by channel chirality and size. Cell & Bioscience 2014, June, 4:30. Guo P. et al. Common mechanisms of DNA translocation motors in bacteria and viruses using one-way revolution mechanism without rotation. Biotechnology Advances 2014, July 32:853.